Take your pick from the RD-700GX (top) and RD-300GX. With all the hullabaloo surrounding its new Fantom-G series, the launch of Roland's two new RD-GX digital pianos kind of got lost in the mix at the 2008 Winter NAMM show. They look impressive though, with the larger RD-700GX benefiting from the company's new SuperNATURAL tone generation technology. 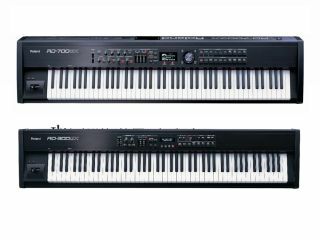 Both the RD-700GX and its smaller sibling the RD-300GX feature 88-note keyboards and incorporate Roland's finest sampled piano sound (you can customise this using the Piano Designer feature). Electric piano and other sounds are also onboard - in fact, it's the electric piano bank in the RD-700GX that uses the SuperNATURAL technology. Other features of the RD-GX series include the ability to play back MIDI, WAV, AIFF and MP3 files from a USB key (useful for jamming), and the option to use the lowest octave on the keyboard for controlling parameters. Both keyboards are equipped with a pair of Roland SRX expansion slots. No news yet on when the new pianos will be released or how much they'll cost. Contact your local Roland dealer or go to the Roland website for more information.